The Speedway Sedans Australia, National Super Sedan Title is just over a week away, with fans expected to flock to the Heartland Raceway, Moama for the National Super Sedan Title, which has attracted forty six drivers. Kyall Fisher from Roma in Western Queensland is one of those, with the twenty eight year old to drive a leaf spring Rocket Chassis in the Title. Fisher has been racing since the age of eight, and will compete in his third National Title, but is yet to race at Moama. I have not raced at Heartland raceway Moama yet, but I am looking forward to it. I have seen some video footage and it differs from time to time, as with every track we race on, it looks to be suitably wide to produce some great racing and I think the last video I watched there were some characteristic ruts and bumps, this could catch a few drivers out and potentially be a field leveller. I also think if it turns up that way it brings the leaf spring car back into the game as they handle a rough track quite decently. I have also seen from a fellow Queensland competitors social media page it can be harrowingly slick so that will also be a game changer. I am eagerly awaiting the running of the Victorian title at Heartland raceway and will be keeping a keen eye on the track conditions throughout the event, it will be the best gauge I think for our team to make the closest call with what to do for the opening run in practice for the Australian championship, Fisher commented. 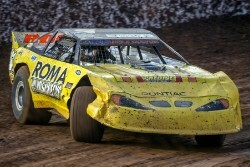 With all National Titles, it is more than just racing, it is an event, and Fisher is looking to catching up with many. I am really looking forward to catching up with the great group of Super sedan competitors from all over Australia, and the excitement of competing once again, against the best. As ever, we will go out to give our absolute all and try to put on some great racing for the fans, he said. National Titles see every move, magnified by the importance of the occasion, something Fisher totally agrees with. Competing in National Titles is all about finishing your heat races and banking points, being consistent with your finishes also and staying out of harms way where possible. There is no point crashing the field in turn one trying to make up one spot, so it pays to sometimes ride a little and watch the lines of the other drivers. Fourth place points pays more than sitting on the infield with a wrecked car and work to do. With so many great drivers and a big count of cars this title will be all about finishing every event as best as possible, and trying to keep the car as straight as possible. But as we know most of the time at race meetings like this, everyone has the same plan and the racing is usually top shelf, Fisher added. Fisher has not raced as much as he would have hoped this season, but believes he is ready as he can be for next weekends National Title. This season has seen us racing a little less than we would have liked, work commitments have held our maintenance and traveling ability up somewhat, but as working a family business, we all know you have to make money to pay the bills and that is the way life is. We have contested four shows only this year, we have had very strong runs and clicked off a Feature win at Bundaberg early on, but really found some strong pace and consistent form through changing track conditions at Archerfield for the second night of the Summer Slam, we came away with one heat win and a third place, qualifying us out of position two for the gold shootout, started fourth and came home fifth in the final which we feel was excellent given the competition we have here in Queensland, Fisher said. Fisher is looking forward to many things from the title, and is looking forward to the entire experience. To be honest I am looking forward to racing against all the drivers I will be up against. I used to be a little aggressive, but I have some manners with racers now and I really respect everyone on the race track as equal across the board. Without a doubt though for me my ultimate moment is looking in the program, and seeing my name in the list with so many legends of our sport, to be amongst them is really the greatest, Fisher commented. When it comes to the drivers to beat, Fisher like many has mentioned the big three, Harper, Kane and Pascoe, but he adds a few others into the mix. Firstly there is the current champion, Callum Harper, he has been so consistent and able to work his way through fields and carve them up. Darren Kane and Matt Pascoe, those guys just keep clicking wins all over and so it is hard to go past them. Sean Black has been ever consistent of late and he is a real threat, with his late race charges being really neat. Finally, the next driver to watch is my biggest idol, second only to my own dad, is none other than Mr Wayne Randall. He has taught us so much in our time racing together and I think Wayne still has the drive in him to capture that elusive number one, I for one will be jumping for joy if he can achieve it, he said. As always every driver aims to go out and win and that is no different for me, but making the championship final is the first goal we set, qualifying directly this year will be our main focus as we made it last season via winning the B main, and improving on our finishing spot which was fourteenth, he concluded.